Biomimicry and bio-inspiration: Inventions based on geckos, lotus, porcupine, parasites. 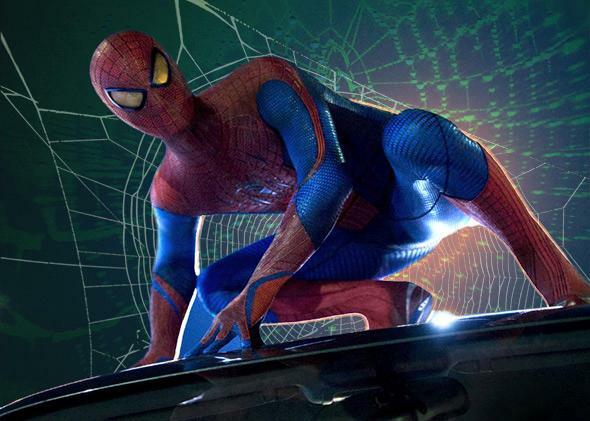 What could an inventor of medical technologies based on nature learn from Spider-Man? An unwitting trailblazer in the field of bio-inspiration. Photo illustration by Slate. Photo courtesy of Sony Pictures Entertainment Inc.
Jeff Karp is an associate professor at Brigham and Women’s Hospital and Harvard Medical School. His research combines bio-inspiration, materials science, and stem cell biology to develop innovative medical technology. He is also the co-founder of Gecko Biomedical, specializing in wound closure technologies. Like Peter Parker, he takes ideas from nature and improves on them to make the world a better place. Taking inspiration from nature seems very popular right now. Why is that? Bio-inspiration is an idea that has been around a long time, but it’s only recently that we’ve seen tangible examples applied to everyday problems and actively shared by social media. Based on the super-hydrophobic properties of lotus leaves, surfaces have been developed that can repel water—and they may one day make windshield wipers more effective or even unnecessary; tree frog toes have inspired tire treads; and several research groups have mimicked gecko adhesion to create tapes that allows robots to climb walls. It’s supercool. What is the difference between bio-inspiration and biomimicry? Is it more than terminology? As the name suggests, biomimicry is where you copy directly from nature. Bio-inspiration, on the other hand, is where you take an idea from nature and find a way to improve on it for your own purposes. For example, we looked to porcupine quills as bio-inspiration for better surgical staples. Porcupine quills go into the skin easily but are very hard to remove because they have backwards-facing barbs that catch on to tissue, flare out, and create enormous drag. Based on those properties, we developed synthetic quills that have reduced penetration force and increased pullout force. We put those quills on either end of a surgical staple to develop a better fixation system for patients. And we made the system biodegradable, so you wouldn’t have to remove the staples—they simply disintegrate as the wound heals. How do you find the initial inspiration? You’d be surprised at how much you can find just searching the Web. When we were looking for new solutions for tissue adhesion, which is crucial for things like skin grafts, we were trying to find a parasite that had a good way to mechanically interlock with tissue. We would then study the mechanism it used. By doing Google image searching, you can identify parasites that latch on to their hosts in lots of interesting ways. You then start working from there to see what you can mimic. We also take trips to the zoo and the aquarium. But ideas can come from anywhere, really. You just have to get out there and start observing and researching. Is there hubris in thinking we can generally improve on ideas stolen from nature? No. I think that the problems we face in the health care world are very different from those faced in nature. A lot of problems in medicine have been present for decades—and as we try to use technology to solve them, we’ve really had to look beyond our own fields and seek out new sources of inspiration. You’ve said that means looking not only to nature but to other fields of research. Why is that so important? I believe that the process of innovation happens at the interface of disciplines. There are many, many steps required to translate a technology into a solution that has the power to help patients and improve quality of life. Each step requires thoughtfulness and creativity, from finding inspiration for a new material to how you create it, manufacture it, run clinical trials, and so on. As bioengineering has gained ground since the 1990s, there has been a realization that you can achieve so much more when you get very different types of scientists, talking and working together with engineers and clinicians. My lab couldn’t exist without that. Why is collaboration so crucial to what you do? To give an example, when we developed a device inspired by jellyfish tentacles to capture circulating tumor cells in people with metastatic cancer, we joined forces with experts on single-molecule manipulation and nanofluidics. We knew that jellyfish extend their tentacles in the water around them to capture particles of food and wondered if we could use a similar strategy to capture cancer cells in blood. Together, we were able to create these synthetic DNA tentacles that could function at some distance, enabling us to flow 10 times more blood through our device than traditional cell-capture approaches. We couldn’t have done it without everyone’s expertise and input. What are the main challenges in going from initial inspiration to real-world solution? The big challenge is really understanding the problem: not just that it exists or how many people it affects, but the actual biology and clinical requirements. You also need to know what has been tried before, what successes there have been, the drawbacks and limitations of existing technologies, and what it would take for clinicians to even bother trying something new. For instance, using sutures or staples is the current standard of care for attaching skin grafts. But those technologies often result in separation between tissue layers and excessive tearing of the graft due to motion. That can require a painful regrafting procedure or let bacteria in and lead to infection. We looked at how different parasites attach to hosts and found that spiny-headed worms (Acanthocephala) have a needle-like proboscis that swells up to lock in place. This inspired us to develop new microneedles that similarly swell to have strong sticking power but with minimal tissue damage. Before we can advance to clinical testing, we have to understand what would be required to replace existing technologies. You have to know all the practicalities. There are a lot of cool technologies but many just can’t be mass-produced with consistency, or may cost too much to integrate into practice, and so on. Not every bio-inspired idea pans out. How common is failure, and are there upsides to it? We don’t talk enough about failure in science. But nine times out of 10, when you conduct any experiment, you are going to fail. In many ways, we’ve been educated to think that failure is one direction and success is the other. But I think both can point in the same direction: Failure has to come first so success can follow. Understanding that, I’ve tried not only to rate failure as part of the scientific process in my lab but also to find ways to accelerate it. Bio-inspiration requires adaptation and lots of iterations, so failure is part of the process. When we were working on the device for capturing circulating tumor cells, initially, our synthetic tentacles were not working well; they were folding on top of each other. We quickly learned that we had to introduce spacer groups between each of the capturing ligands if we were going to solve that problem. How can you avoid investing too much in ideas that ultimately fail? Do you mean, what happens if you’re developing a technology and find out two, three years down the road that it’s a failure? Sometimes it’s too late to make big changes. So what we try to do at the start is identify the most challenging aspect of a design or the most important experiment we need to do, even if it means developing a really crude prototype. We try to figure out if we’re even in the right ballpark before we get too invested. No one ever gets it right the first time. But you can maximize success by pressure-testing your ideas to find the biggest holes as early as possible. You have to leave your ego at the door because the goal is to figure out quickly just how you are failing. If you can be open to that, you’ll eventually find your way to success. You’ve called Spider-Man a sort of mascot for bio-inspiration. Why is that? And if you had some face time with him, what would you ask? In many ways, Spider-Man is the ultimate example of stealing from nature. His special power is spider webs—but instead of using them to catch food, he uses his talent to fight crime and make the world a better place. If I got to meet him, I suppose I’d ask what the composition of his web is, how he came up with it, and how to synthesize it and modify it for different applications.